Two of the president’s fiercest Republican foes have come to Canada’s defence as a trade war brews between the U.S. and its neighbour to the north over steel and aluminum tariffs — with at least one senator slamming U.S. President Donald Trump’s actions as “insulting” to such a close ally. 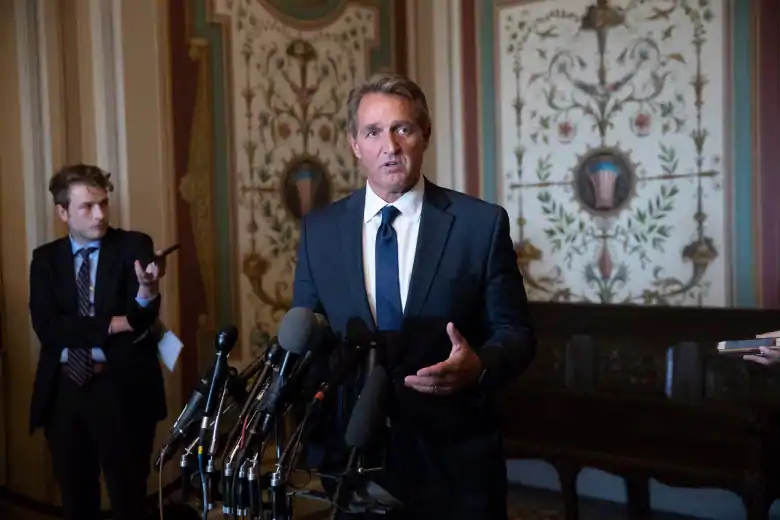 Top Republican lawmakers Sen. Jeff Flake of Arizona and Sen. Bob Corker of Tennessee — both outspoken critics of Trump in recent months — said the Trump administration’s justification of these punitive tariffs on national security grounds is bogus and an abuse of U.S. law. “Can you imagine, being Canada, our closest ally on the planet, and being told that they represent a national security threat, that the export of steel and aluminum is threatening our national security?” Flake told reporters Wednesday after he and other members of the powerful Senate foreign relations committee met with Foreign Affairs Minister Chrystia Freeland in Washington. Corker said he doesn’t “think there’s any question” that Trump has damaged relations with Canada after slapping tariffs on its imports and lobbing personal insults at Prime Minister Justin Trudeau. Corker and other lawmakers — Democrats and some of Trump’s fellow Republicans — have backed an amendment to the National Defense Authorization Act — a sweeping defence policy bill that Congress passes every year — to prevent the president from imposing tariffs on national security grounds without first obtaining the consent of Congress. Trump’s tariffs were imposed using presidential authority granted under Section 232 of the Trade Expansion Act of 1962, which gives the president broad powers to impose tariffs without consulting Congress. “Canada is not a country we have trade issues with,” he said. Section 232 has only been used twice before in U.S. history to restrict imports: in 1979 on oil imports from Iran, after that country’s theocratic revolution resulted in the storming of the U.S. Embassy in Tehran; and in 1982 against similar imports from Libya. Freeland’s trip to Washington also included being awarded Diplomat of the Year by Foreign Policy magazine. In her acceptance speech Wednesday evening, she addressed U.S. tariffs by saying they were illegal, “protectionism pure and simple” and hurtful. “They are a naked example of the United States putting its thumb on the scale, in violation of the very rules it helped to write,” she said. In a speech arguing for a reaffirmation of an international rules-based order, Freeland took thinly veiled shots at Trump’s use of populism to rally against global conventions that have seen the world prosper in the postwar era. Senators Flake and Corker risk nothing in defying Trump openly by siding with Canada, since both men have opted not to run again in the November midterm elections. Anti-Trump Republicans have faced poor electoral fortunes in recent months because the party’s base remains loyal to the president and his America First agenda. Several Trump critics went down to defeat in Tuesday’s Republican primaries. Republican Utah Sen. Orrin Hatch — the chairman of the Senate’s powerful finance committee who has praised the president for his leadership on tax reform — also announced Wednesday that Commerce Secretary Wilbur Ross will appear before the committee as part of its study of the administration’s use of Section 232 to justify the metals tariffs. That’s welcome news to Freeland who has said the national security justification of these tariffs is deeply offensive to Canada and will be met with “dollar for dollar” reciprocal tariffs. “Canada has been very clear. The Section 232 justification is frankly absurd. The notion that Canadian steel and aluminum could pose a national security threat to the U.S. — I think Americans understand it’s simply not the case. It is illegal under NAFTA and WTO rules,” Freeland said, while noting the U.S. has a surplus in steel trade with Canada. 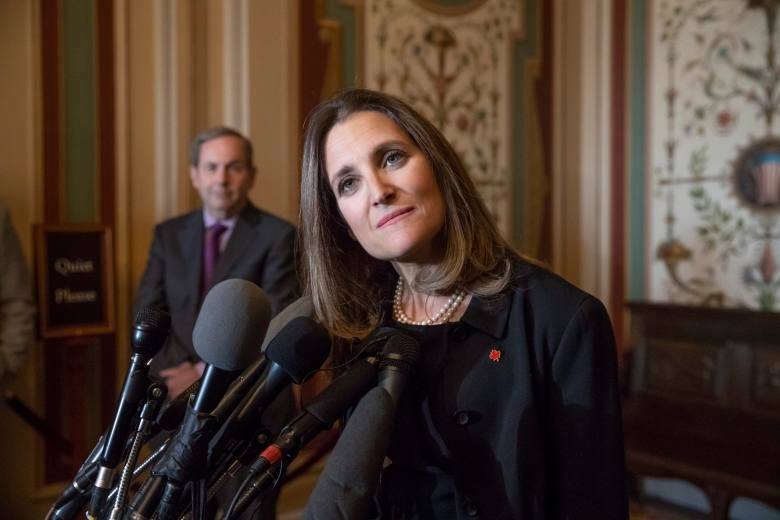 Freeland is in Washington for two days of meetings with U.S. lawmakers — the first visit by a high-profile minister to the United States since Trump launched his blistering attacks against Trudeau and Canadians at large. Initially, the U.S. exempted Canada, Mexico and the EU from new tariffs on steel and aluminum imports. Trump subsequently rescinded those exemptions as part of his drive to protect U.S. industry from what he claims is unfair foreign competition. Now, a 25 per cent tariff will be levied on Canadian steel, while a 10 per cent tariff will be applied to aluminum. In response, Canada slapped the U.S. with $16.5 billion worth of new tariffs on a host of U.S. goods, from lawn mowers to playing cards and felt-tipped pens. In a January 2018 report prepared by the U.S. Department of Commerce on steel and aluminum imports, the department concluded that a flood of cheaper foreign imports of these materials has hobbled the U.S. industry — meaning American companies might not be able to quickly respond to procurement requests from the U.S. Department of Defence. In other words, the Trump administration isn’t claiming that Canada poses a physical threat to the U.S. — but it is arguing that its cheaper products threaten the continued viability of the U.S. metals industry and its capacity to respond to military demands. “As steel imports have increased, U.S. steel production capacity has been stagnant and production has decreased,” the report reads.